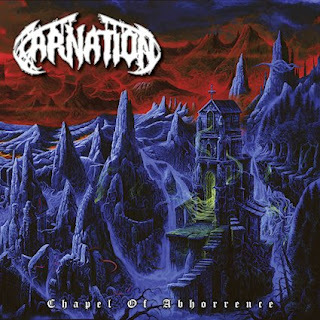 Carnation is exactly the sort of death metal band that makes Season of Mist great. Squirrely, vicious and full to the brim of unique and exciting ideas it's hard not to be mesmerized by the unholy offering that Carnation make with their latest record, the almighty Chapel Of Abhorrence. This isn't an album that necessarily plays by the rules, but it does showcase quite a few death metal tropes. To it's credit it delivers these in an effective and fun way and hints at a lot more to come from these Belgian death metal punishers. 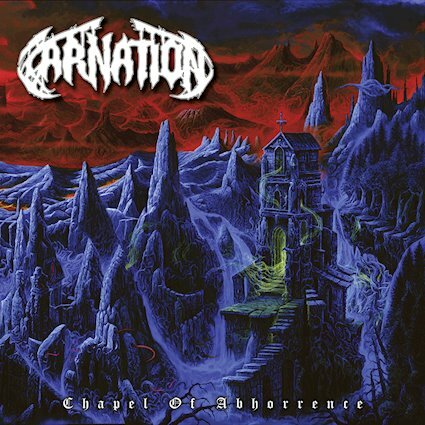 There is a great melodic sensibility to what Carnation are doing here that makes Chapel Of Abhorrence wonderfully re-listenable. These songs reflect a lot of thought being put into the songwriting and showcase a band who unleash pure aural decimation but also know enough to temper it with all sorts of uniquely powerful musical twists and turns. With doomy touches adding a nice layer of polish to a brutal finish, this is a record that plumbs the depths of the human psyche. While unabashedly a death metal album, the guys are clearly unafraid to bring in other influences, but they do it in a way that is distinct and exciting. The sense of forward motion that you get with these songs is thrilling. The balls to the wall assault you hear in a track like Hellfire is perfectly counterbalanced by some of the more pensive moments on the record. At times you can see circle pits opening up in front of you and at others you are going to simply revel in the murk and ponder the grim truths that Carnation seem so eager to paint. There's a lot going on here and you're not going to soon forget the mosh-worthy assault of these Belgian masters.